Jay Stoltz's slam-dunk dartboard will hit the bull's eye with any basketball buff. Combining the thrill of sitting courtside with the casual fun of a bar favorite, Jay Stoltz's slam-dunk dartboard will hit the bull's eye with any basketball buff. 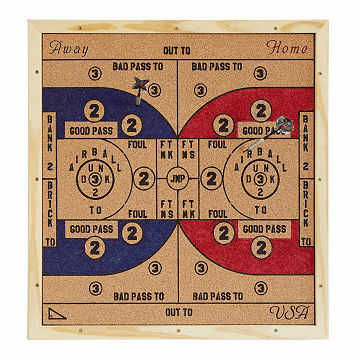 Follow the basketball-inspired game play detailed on the handcrafted board and "pass," "jump," and "shoot"--of course!--your way to victory. Made in Roanoke, Virginia. Jay is a proud public school teacher and basketball coach. Jay currently possesses a bachelor’s degree in business and a master’s degree in education. Through college, Jay worked numerous construction jobs where his passion for quality woodworking grew. A few of Jay’s favorite pastimes include playing board games and card games with his wife, Beth, along with playing and teaching the game of basketball. Jay is very passionate about teaching and inspiring others to better themselves through education, as well as, helping people enjoy life, relax, and just have fun playing the games he creates. Includes 3 darts, game instructions, scorecard template, mounting hardware and mounting instructions. Play in teams of two just like in basketball!